Have your teeth become damaged over time or do you have gaps as a result	of missing teeth? Not only can missing or broken teeth lead to lower self-esteem,	but it can affect your placement and your bite. It is vital that you take	action to restore your teeth and fill those gaps with bridges and crowns. At Premier Dental Care, our Henderson dentist can help you to address	any dental problems you have, including fitting you for a bridge and/or crown. 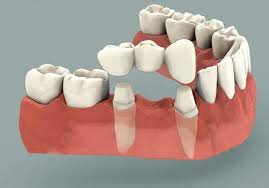 We offer	several different types of bridges and crowns, customized for your specific needs. When you come in for your initial consultation, our staff can help determine	which type of bridge or crown is appropriate for you specific situation. We also provide same-day treatment options for your convenience. For more	information regarding our services, please	call (702) 565-0000 to schedule an appointment with one of our Henderson dentist.